Understanding the different types of roofing material will help ensure that you have a long-lasting and waterproof porch roof. 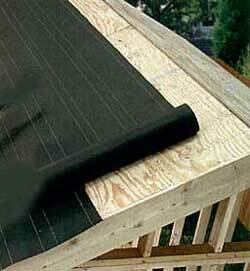 Once your porch roof has been framed it is time for the roofing materials. Normally, this will consist of sheathing (metal roofs require perlins), drip edge, ice and water barrier (in some geographical areas), tar paper (also called roofing felt or building paper), and shingles, tiles, slate, metal or other materials. The type of sheathing you use depends on the roof covering. Use CDX plywood (it's exterior grade) or oriented strand board (OSB) for asphalt and cedar shingles. Oriented strand board won't cup, warp, or delaminate like plywood can do in some cases. 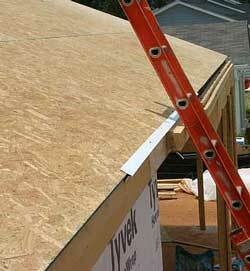 OSB usually has consistent quality without any voids or knots. You can also use tongue and groove decking boards as an alternative to plywood or OSB sheathing. Typically sold in 1 1/16" thick boards this sheathing creates an automatic attractive "ceiling" for the inside of the porch. For metal roofing, install purlins — evenly spaced, parallel rows of 1 × or 2 × boards nailed perpendicularly to the rafters. Install the fascia over the ends of the purlins, flush with the tops. The picture at right shows OSB sheathing and drip edge being installed. After the roof surface had been completely cleaned of debris and all loose boards had been fastened down, install drip edge (also called "edge iron") with 1-1/4" galvanized roofing nails along the eaves. Drip edge directs water along the eaves and keeps it from contacting the sheathing along the edges. A discussion of the different types of roofing material would not be complete without including ice and water barriers. Ice and water barriers protect against leaks caused by ice dams and wind-driven rain. It forms a water-tight barrier to prevent water from reaching your sheathing. The barrier is installed along the front edge of the roof and valleys. It usually comes in 3-foot-wide strips and is very sticky... don't even think about pulling it off once you put it down! I've applied this to our roofs and can attest to it's effectiveness. It's a great product, one which I highly recommend you use not only for your porch roof but for your home's roof as well. Ice and water barrier like that from Owens Corning pictured at above right can be obtained at most local building supply stores. 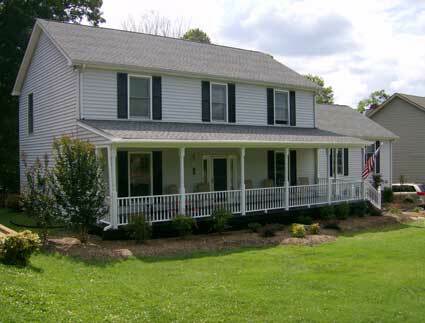 In some localities, it is required by local building codes to be installed on roofs. Check with your local building codes department. It's a temporary roof until the permanent materials are installed. Helps to prevent damage if a leak occurs in a tile/slate. Roofing felt usually comes in two "weights" , 15 lb. and 30 lb. Roofing felt used to contain tar but now synthetics are used. Some newer "felts" have fiberglass weaves. Knowing the different types of roofing material and how they work will ensure your porch roof is constructed to do its job. See our Comparisons of Roofing Materials section to determine your last layer of roof protection.